When a cavity is undetected, or left untreated, the bacteria causing the decay advance deeper into the tooth and close to, or into, the nerve space. This results in a dental infection that is typically quite painful and leads to a chronic dental infection or abscess if not addressed. If the decay is not too extensive and there is enough tooth to save, a root canal can be done to remove the infected nerve tissue, and preserve the tooth. A root canal involves removing the infected or dead nerve tissue, disinfecting the nerve space, and filling the root space. 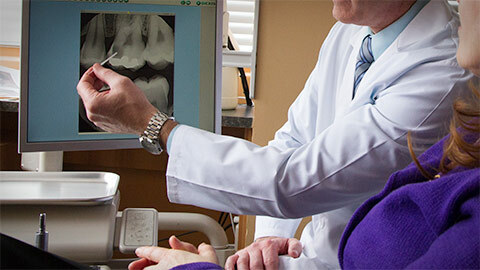 A crown is usually recommended after a root canal to prevent the tooth from fracturing over time. If you are suffering from the pain of an infection in the pulp and nerves inside your tooth, call us today. We have the professional staff that will treat the problem and relieve your pain.